This client offers variations of Power Air Fryer Ovens With 7 in 1 Cooking Features with Professional Dehydrator and Rotisserie. The secret is Power Air Fryer Oven's Rapid Air Technology that cooks food with a whirlwind of super-heated air for that great crispy-fried taste without all the added fat and calories. The Power Air Fryer Oven is a full oven multi-cooker that gives you all of the crisp, juicy, delicious, and healthy benefits of oil-free air frying. Before we took over the account, the client was having a very hard time reaching their CPA goal. Our main objective was to decrease CPA towards their goal while driving overall growth. The current structure within the account was not developed for long term success. There was just one campaign with poor structure, and one ad group on the low campaign priority setting. The account needed a more granular structure, feed optimization (titles with high volume keywords, high quality images, quality descriptions) and segmented search terms. Our first goal was to create the heart of any successful Google Shopping Campaign – well-optimized product feed. With full use of all relevant shopping feed attributes, we direct the most attention to maintaining accurate pricing, inventory levels, and smartly-worded product titles and descriptions. Title has a significant effect on CTR. 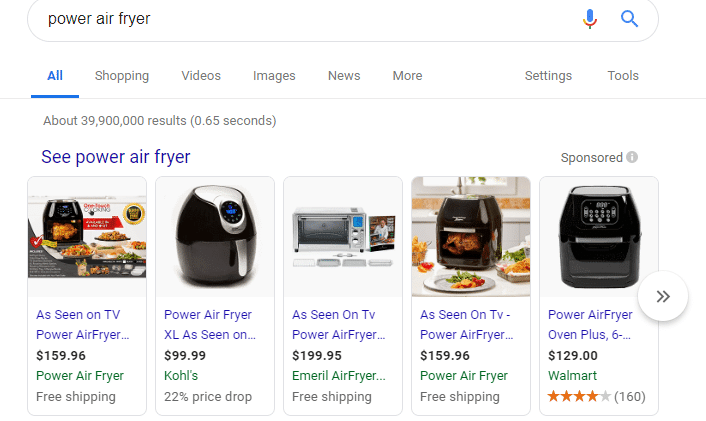 So for Power Air Fryer, we wanted to include the most important high-volume keywords at the beginning of titles, such as the name of the brand followed by material, color, size or any other product specifics. In terms of structure, we focused on three dimensions: product groups, devices and queries. Conversion rates on mobile are typically much lower than on desktop, but not for every product. Therefore, item bids needed to be adjusted to the performance differences between mobile, tablet and desktop. We started with a high priority main campaign that contained all the products and was broken out by device along with a “catch all” low bid campaign. This was followed by a remarketing campaign designed to re-engage previous site visitors, increase CTR and CVR and lower CPA even further.